Sentences can be active or passive. 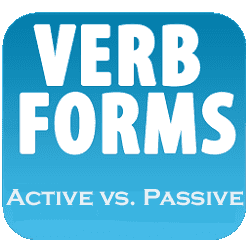 Therefore, tenses also have "active forms" and "passive forms." You must learn to recognize the difference to successfully speak English. In active sentences, the thing doing the action is the subject of the sentence and the thing receiving the action is the object. Most sentences are active. The Facilitator teaches the Students. In passive sentences, the thing receiving the action is the subject of the sentence and the thing doing the action is optionally included near the end of the sentence. You can use the passive form if you think that the thing receiving the action is more important or should be emphasized. You can also use the passive form if you do not know who is doing the action or if you do not want to mention who is doing the action. The students are taught by the facilitator. The dishes are washed by Janny. Once a week, Tom cleans the house. Once a week, the house is cleaned by Tom. Right now, Sarah is writing the letter. Right now, the letter is being written by Sarah. The car was repaired by Sam. The salesman was helping the customer when the thief came into the store. The customer was being helped by the salesman when the thief came into the store. Many tourists have visited that castle. That castle has been visited by many tourists. Recently, John has been doing the work. Recently, the work has been being done by John. George had repaired many cars before he received his mechanic's license. Many cars had been repaired by George before he received his mechanic's license. Chef Jones had been preparing the restaurant's fantastic dinners for two years before he moved to Paris. The restaurant's fantastic dinners had been being prepared by Chef Jones for two years before he moved to Paris. Someone will finish the work by 5:00 PM. The work will be finished by 5:00 PM. Sally is going to make a beautiful dinner tonight. A beautiful dinner is going to be made by Sally tonight. At 8:00 PM tonight, John will be washing the dishes. At 8:00 PM tonight, the dishes will be being washed by John. At 8:00 PM tonight, John is going to be washing the dishes. At 8:00 PM tonight, the dishes are going to be being washed by John. They will have completed the project before the deadline. The project will have been completed before the deadline. They are going to have completed the project before the deadline. The project is going to have been completed before the deadline. The famous artist will have been painting the mural for over six months by the time it is finished. The mural will have been being painted by the famous artist for over six months by the time it is finished. The famous artist is going to have been painting the mural for over six months by the time it is finished. The mural is going to have been being painted by the famous artist for over six months by the time it is finished. Jerry used to pay the bills. The bills used to be paid by Jerry. My mother would always make the pies. The pies would always be made by my mother. I knew John would finish the work by 5:00 PM. I knew the work would be finished by 5:00 PM. I thought Sally was going to make a beautiful dinner tonight. I thought a beautiful dinner was going to be made by Sally tonight.